One of the easiest ways to add some personality to any room is by amping up the fun factor with your lamps and lampshades. 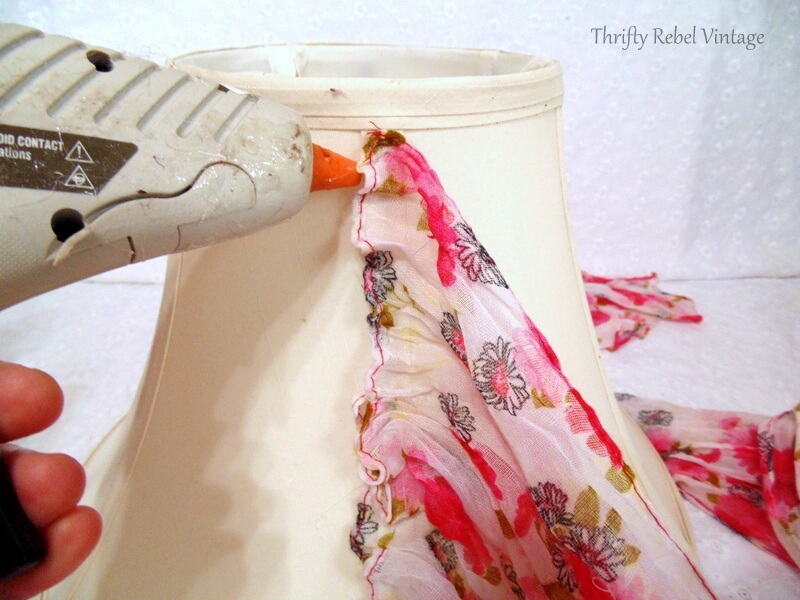 This diy lampshade makeover is pretty quick and easy, and the only tools you need to get it done are a glue gun and a pair of scissors. 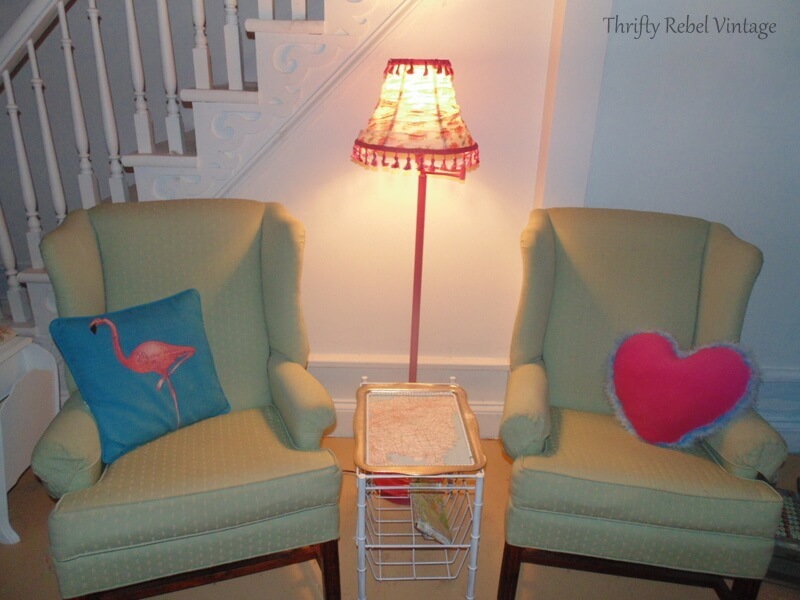 My lace stenciled blink makeover that I shared last week added some color and pattern to the living room windows. 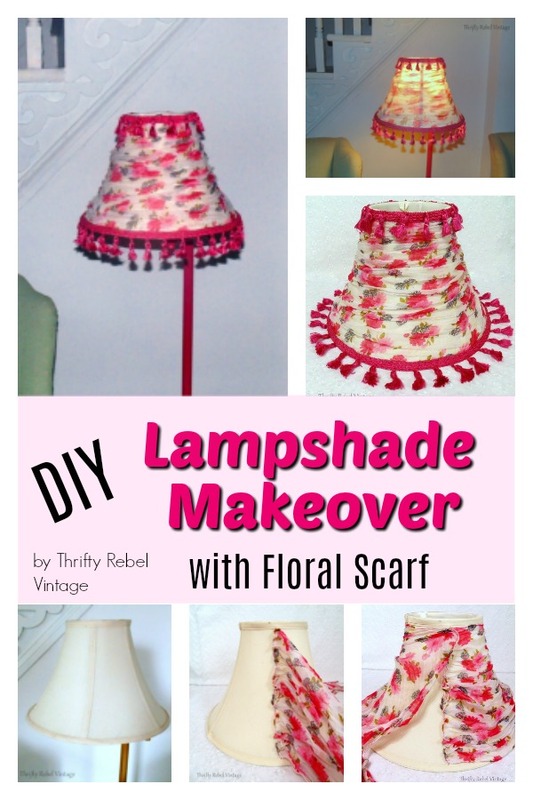 And moving on with my living room makeover this lampshade is another fun and colorful project that will look beautiful against my white painted walls. 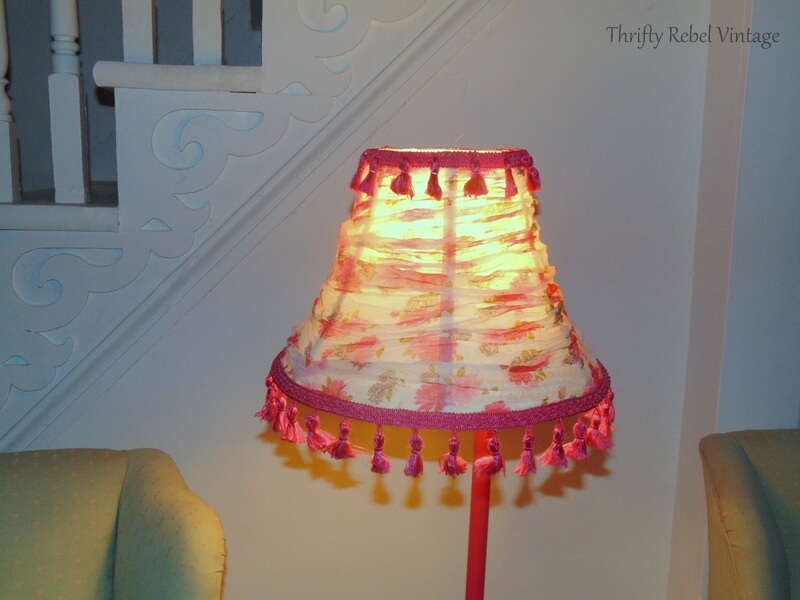 Here’s a before of the $2 thrifted lampshade that I recently found for our $5 thrifted living room floor lamp. The lampshade that came with the lamp had a plastic frame that went all brittle and basically fell apart. 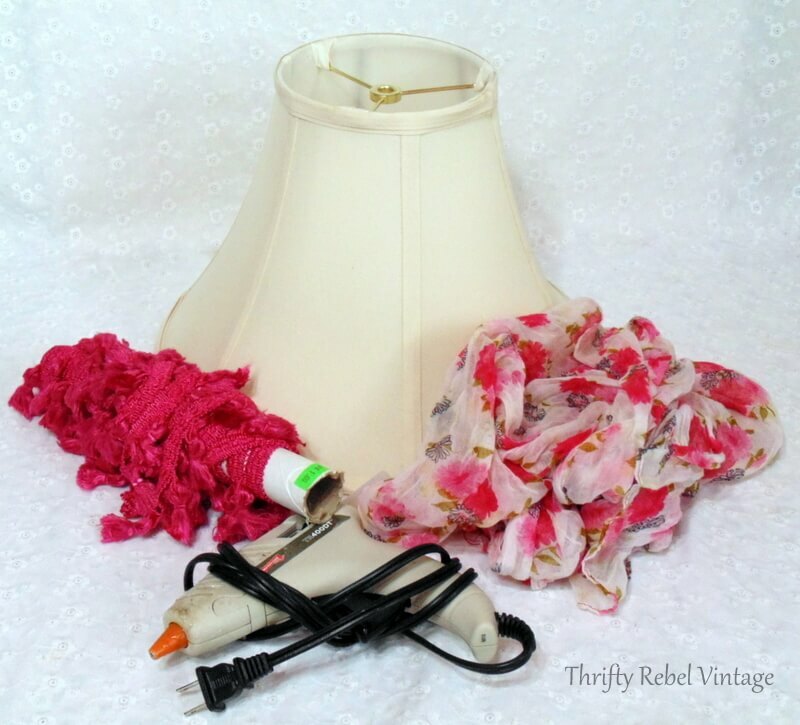 All I needed for my diy lampshade makeover was this pretty floral scarf that I got for 50 cents, and my $1 roll of pink tassel trim. 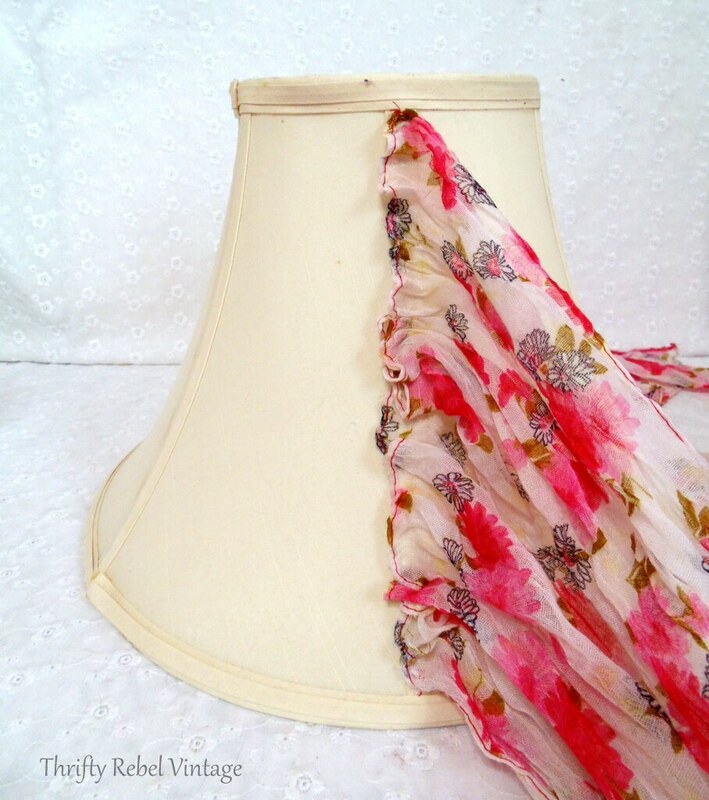 This scarf is about 18″ wide, but the lampshade is only 12″ tall. So I had two choices: either cut the scarf to the size of the lampshade for a fitted look, or use the difference in width as an opportunity to let myself go creatively. The former would be much more difficult because of the shape of the lampshade. So I opted to go with the easier latter route, which gave me a more fun and relaxed look. I started by gluing one end of the scarf to the piping along one of the vertical frame ribs. Because we’re wrapping the scarf around a long narrow scarf is best. I made my way all the way down, gathering the scarf as I went. It looks a little messy right now but it will clean up nice when I’m finished. 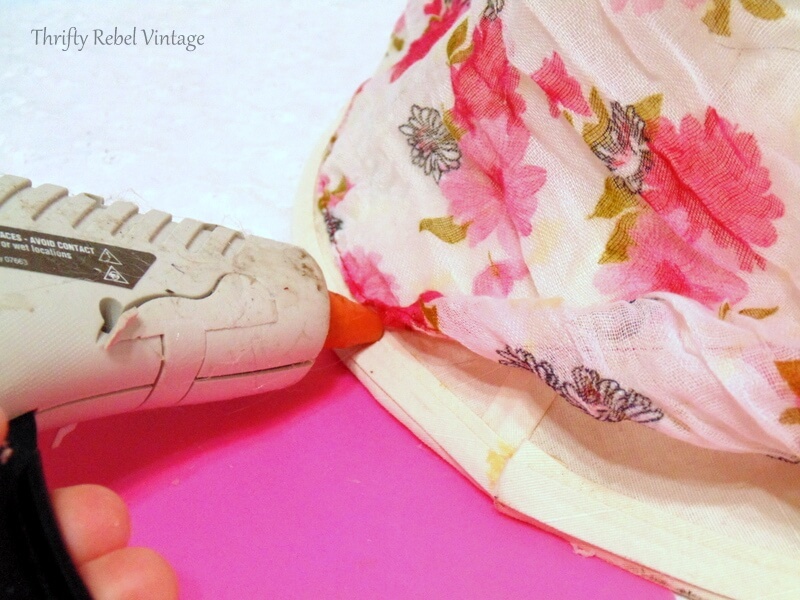 The I glued the top edge of the scarf around the top of the lampshade. 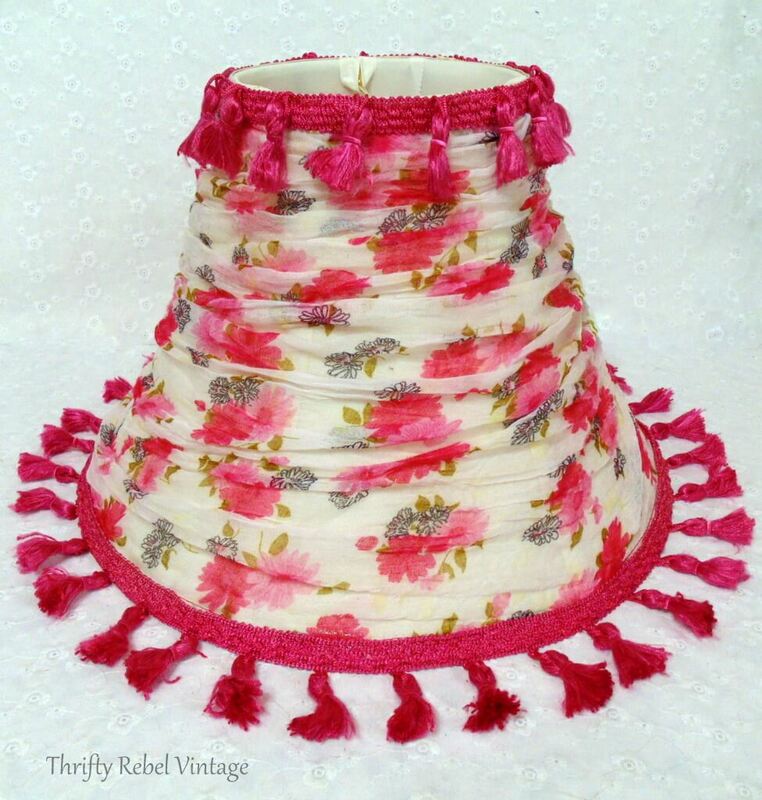 I glued the top edge of the scarf all the way around the top of the lampshade, just below the piping trim. 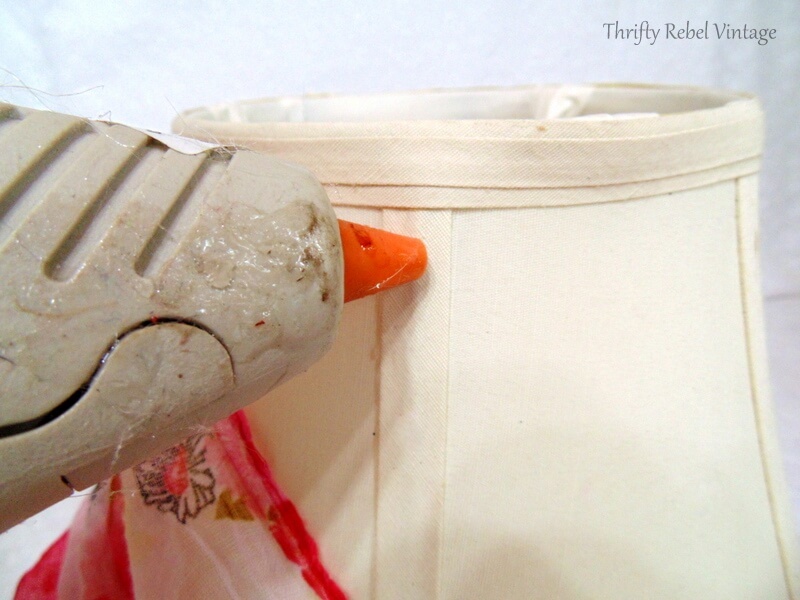 Then I glued the bottom edge of the scarf to the bottom of the lampshade… just above the piping trim. When your’e doing this there will be excess scarf material in the middle area. 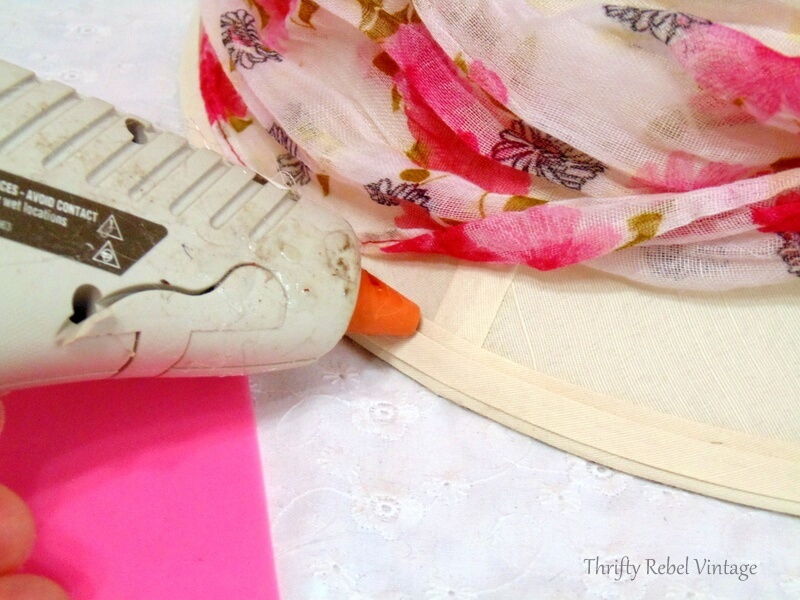 Make sure to keep that loose material out of your way so it doesn’t get glued in by accident. Once you’ve glued all the way around the top and bottom it’s time to gather and glue this scarf end just like the front end. Once that’s done you can cut off the excess scarf material. 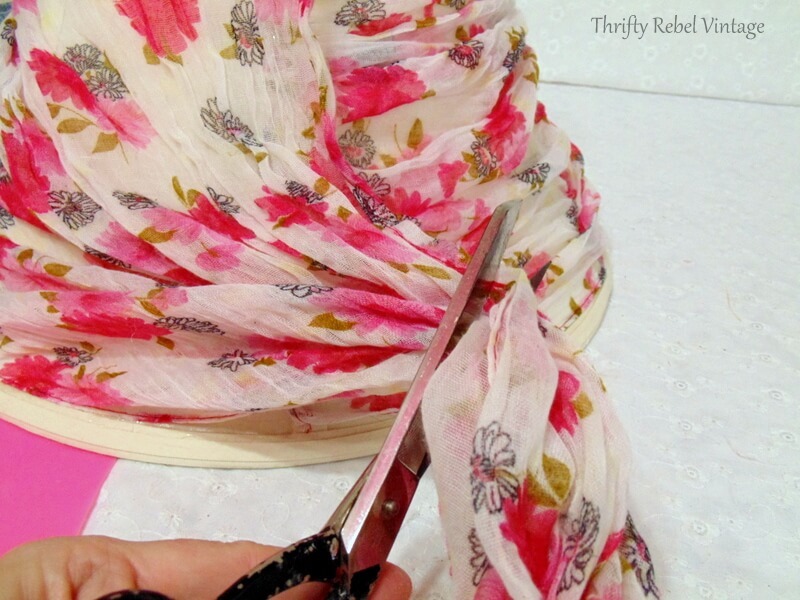 Then using your glue gun you can clean up where the scarf ends meet until the seam looks something like this. It doesn’t have to be perfect because it will be at the back, but you do want it to look nice. … and make your way around. 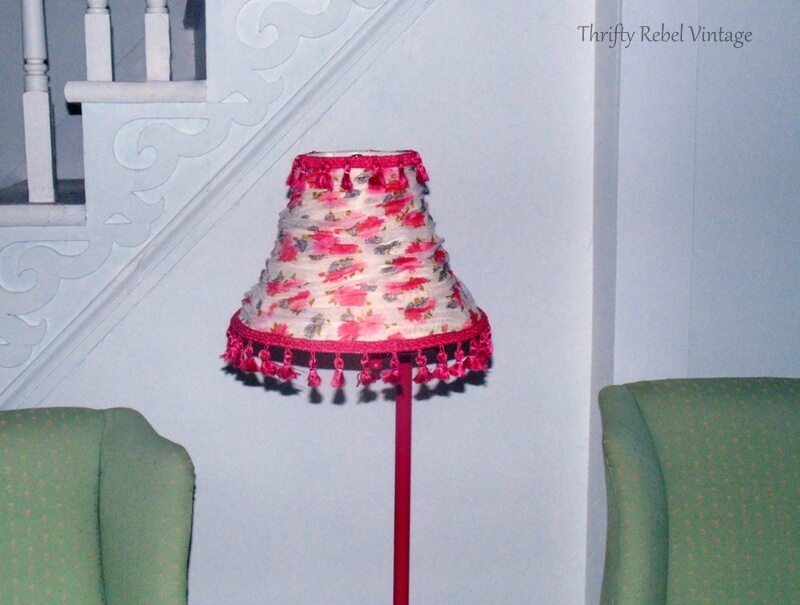 And here’s my finished lampshade. When I was gathering and gluing the scarf at the back I looked at how it was affecting the front as I went along. I really wanted it to have a soft pretty look at the front, but not gathered so much that you can’t see the flowers. You’ll notice that I glued my trim on the top so that the tassel is falling from the top rather than the bottom. This was just a personal choice so the top tassels didn’t stand out quite so much. Also, I can easily cut them off in the future if I want to. 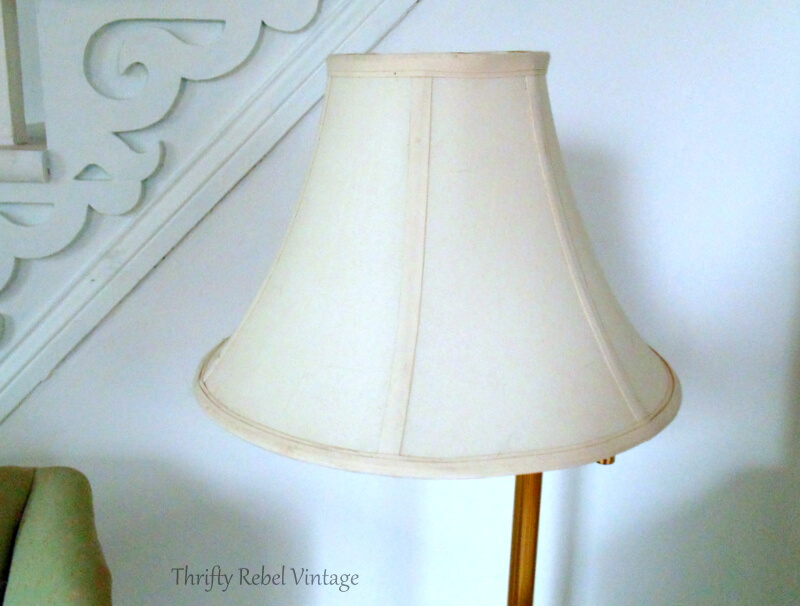 So, here’s my plain and basic lampshade before. The gold of the lamp stand wasn’t working for this color-loving girl so I spray painted it a berry pink to match the shade. Now the whole thing really pops against the white wall. 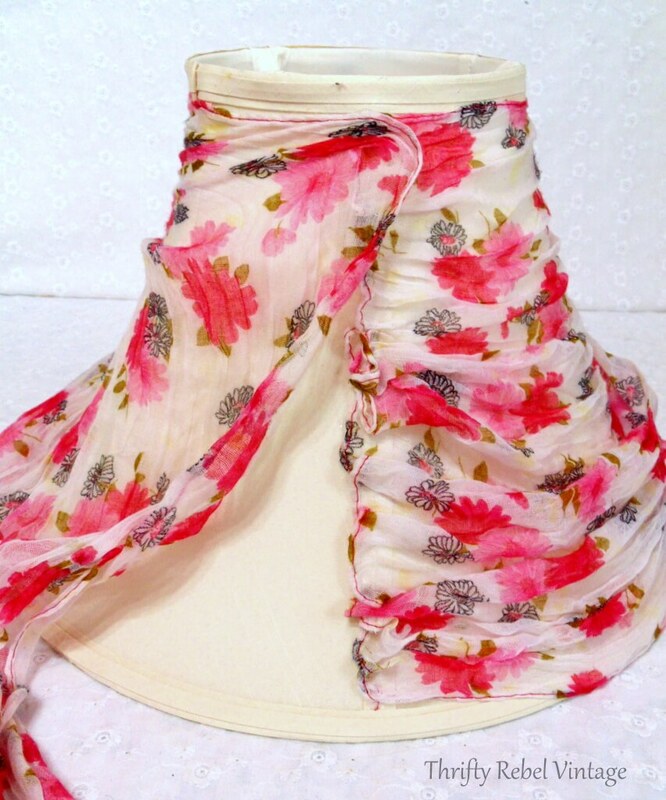 The material of the scarf that I used is translucent so the light filters through it beautifully. The inside is still white so the light is still perfect for reading. 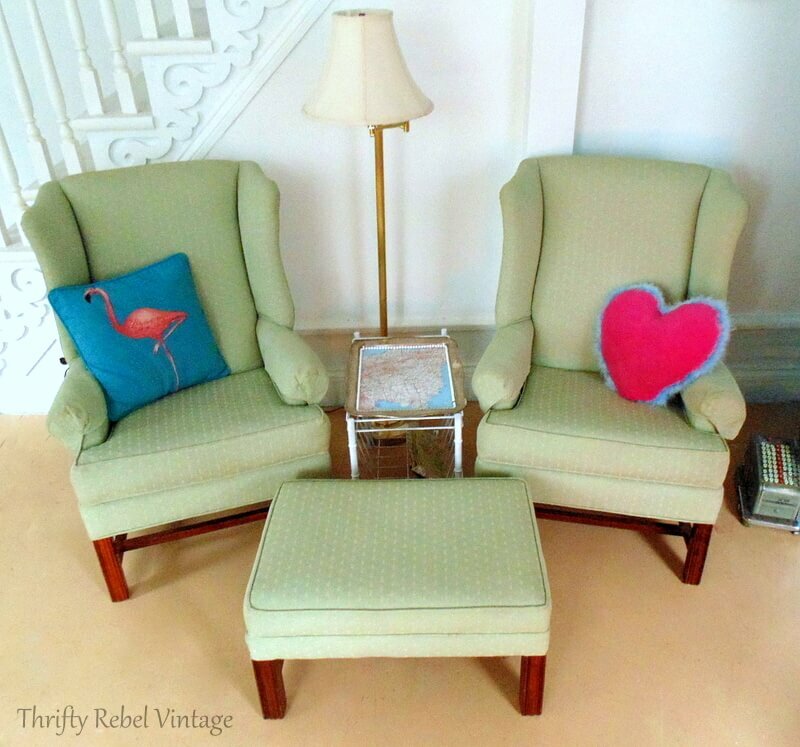 Here’s my living room seating with the green wing chair set that I recently found. And here’s the seating area at night with the new floral shining light. What I really loved about this floor lamp when I found it is that there’s an arm for the lampshade so it can be moved around to shine closer to one of the chairs when only one of us is reading, or over the center area when we both are. It always had plenty of light, but now it’s blooming with personality. Scarves are one of my favorite things to repurpose. 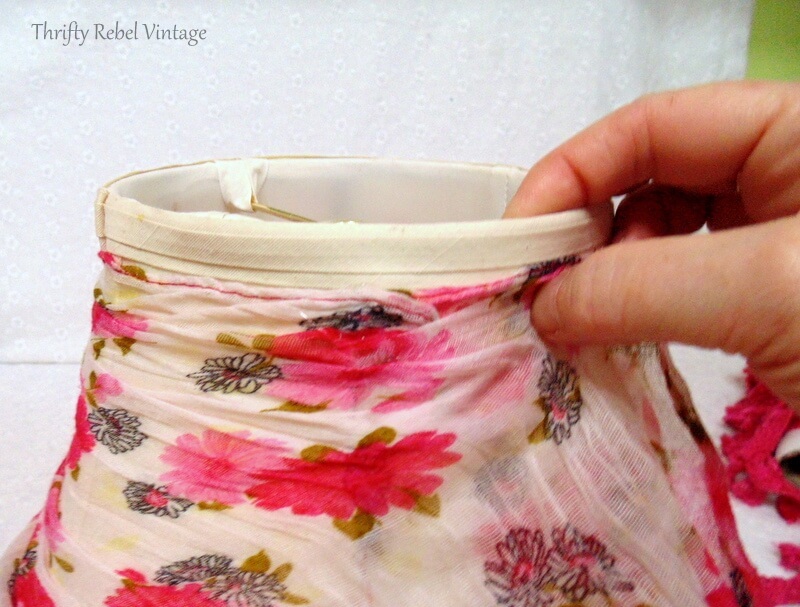 They can be found pretty cheap at thrift stores and garage sales… and be used in so many ways. 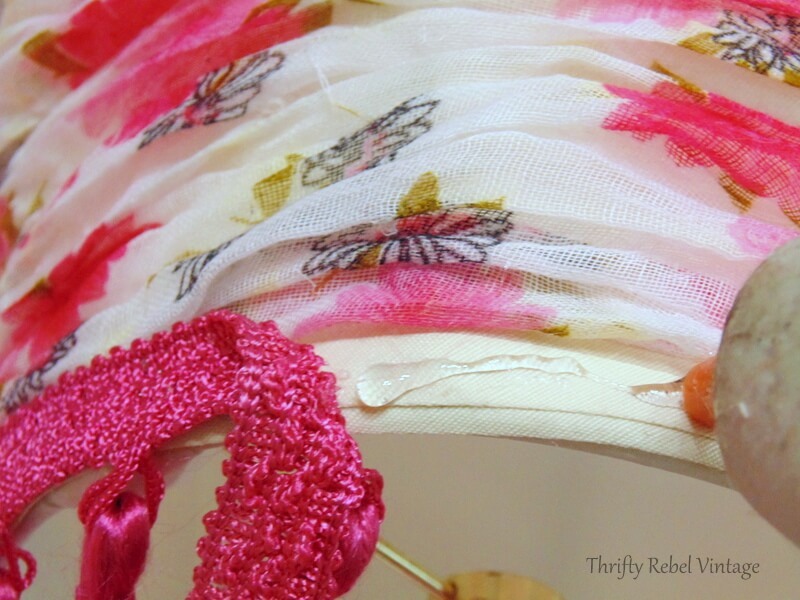 If you enjoyed this project you can see more repurposed scarf projects here. Oh Mighty Clever One; that is really pretty and darn cute to boot. So cool! Having just spent a lot of time on line looking for a lampshade I think this is wonderful. I ended up with a pleasant one from Lowes. It works but not so much in personality like yours. Your living room is really getting a makeover. You are so inspiring!! ? That’s just darling Tuula! I love it! This is really, really pretty! You make it look so easy to do. I am pinning this to my Lampshade board! Thanks AnnMarie! The most difficult thing was finding a scarf that I loved to use. I appreciate the pin! That turned out so pretty Tuula! That is absolutely lovely! I’ve got a few of those to makeover. If I can EVER find the time!